BATTLE FOR WORLD / RT | April 13, 2019: The article highlights that after the International Criminal Court (ICC) declined to investigate claims of US atrocities in Afghanistan, President Donald Trump cheered the decision and said the ICC was “illegitimate” and that US and its allies were beyond its reach. 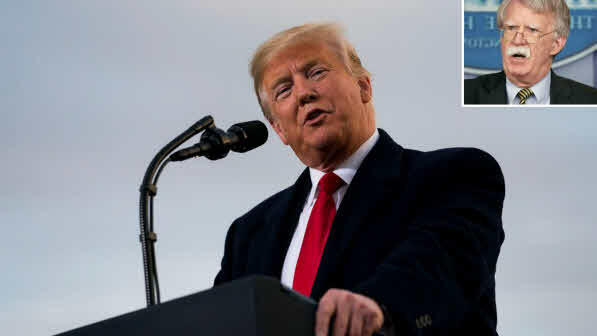 The White House in a statement said: “This is a major international victory, not only for these patriots, but for the rule of law,” referring to the ICC decision to reject the request to investigate the actions of US military and intelligence officials in Afghanistan. That the US “holds American citizens to the highest legal and ethical standards,” and has consistently refused to join the ICC because of its “broad, unaccountable prosecutorial powers,” which threats US sovereignty, and “and other deficiencies that render it illegitimate,” in a statement by Trump. BATTLE FOR WORLD / TASS | April 13, 2019: The article highlights that Russian Foreign Minister Sergei Lavrov announced today that the Western, liberal model of society is dying, and a new world order, based on the multipolar platform is taking its place. Lavrov made the comments at his annual meeting, the 27th Assembly of the Council on Foreign and Defense Policy, with students and professors from Russian schools at the Foreign Ministry’s Diplomatic Academy, reported Russian news agency TASS. BATTLE FOR WORLD / TASS | April 14, 2019: The article highlights that the US Senate should better focus on the United States’ domestic problems rather than indulge in inventing anti-Russian sanctions, Russian president’s aide Yuri Ushakov said on Sunday (April 14). He noted it was high time [long overdue that] US politicians get sick and tired of discussing sanctions against Russian. Saying: “It’s high time they get tired, I think. They have other things to deal with and they’d better do that. They (in the United States – TASS) have a lot of problems to find solutions to,” he said in an interview with the “Moscow. Kremlin. Putin” program on the Rossiya-1 television channel. BATTLE FOR WORLD / NEWSWEEK | April 14, 2019 (posted January 10, 2019): The article highlights that a senior Russian official has canceled a planned visit to the United States, claiming that he feared a second civil war being waged by opposing political forces there. The head of Russia’s Roscosmos State Space Corporation, Dmitry Rogozin, who served as deputy prime minister until May 2017, said Thursday (January 10) that due to rising tensions between Republicans and Democrats the U.S. society was leading to a breakdown. At the time when the article was written it highlighted that the National Aeronautics and Space Administration (NASA), one of many federal agencies affected by a government shutdown due to an inability for the rival U.S. parties to agree on funding for a border wall proposed by President Donald Trump. “I think that America is actually engulfed by its second civil war now,” Rogozin told the Rossiya-24 TV channel, as translated by TASS, the Russian News Agency. “In the finest traditions of our great democracy, we are rallying the noble nations to build a new liberal order that prevents war and achieves greater prosperity for all,” declared Pompeo as he urged countries to rally behind Trump in re-defining a new world order.